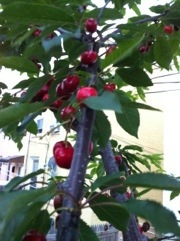 We went cherry picking in the backyard Sunday, June 3. I’ve had the tree several years, but this was the first year there was a real harvest (in past years there have only been a handful of pickable non-mealy ones). My partner and I climbed the tree with paper bags slung over our arms. He took the upper branches. I braced myself between the fence and the lower branches. 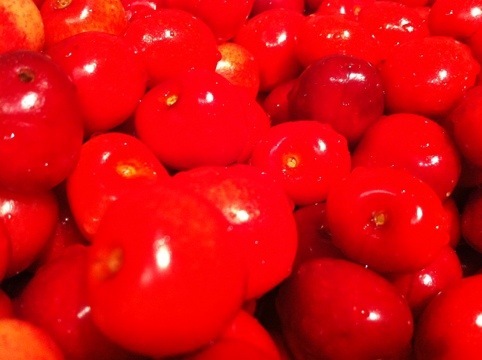 I saw a lot of cherries fall. I caught some. I dropped them into my bag as fast as I could. A little girl, probably about six-years old, in the row of houses behind ours sat in the window watching us, while her mother cooked dinner in the kitchen behind her. At one point I had to lean over, nearly into our neighbor’s yard to reach the cherries on the farthest extending branches. She giggled as she chewed on some candy, watching us. 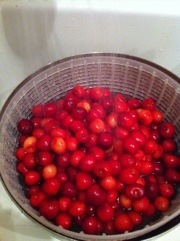 Some of the cherries were not ripe. We probably could have waited an extra day or two. But it was Sunday, my family was in town. We had food on the grill, and gardening getting done. 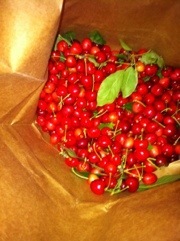 In the end, we got about two big bags full of cherries. There were still more higher to the top. I wanted to climb up high to pick them but my partner told me to leave them, saying, they’re God’s tax. I let them be. He thinks he’s pretty funny. He usually is. We’re going to make cherry ice cream but for now, we have about two large soup containers filled and three gallon freezer bags. We ate some and are saving the rest. I might put my new canning skills to test. 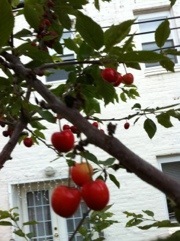 A nice crop of cherries. 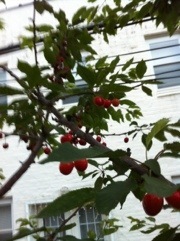 Is this the normal time to pick cherries or is this just another advantage of global warming?